Dua Lipa (born 22 August 1995) is a British singer-songwriter from London. Her debut album is scheduled for release in 2016. 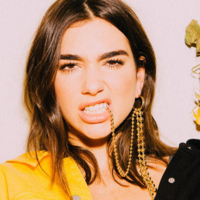 Dua Lipa was born in London on 22 August 1995. Her parents, who are Kosovo Albanians, had left Pristina in the 1990s. Among the schools she attended was the Sylvia Young Theatre School. When Dua was 13 she moved with her family to Kosovo at around the time the state declared its independence from Serbia. At the age of 15 she moved back to London living with friends, because she wanted to build a career in music. At the age of 16 she began working as a model. In 2015 Dua Lipa began working on her debut album for Warner Bros. Records, utilising the same management team as Lana Del Rey. In August 2015 she released her first single "New Love". The single was produced by Emile Haynie and Andrew Wyatt. She released her second single "Be the One" in October 2015. She describes her musical style as "dark pop". On 30 November 2015, she was revealed as one of the acts on the BBC Sound of...2016 long list. Her first UK tour began in January 2016. Her debut album is scheduled for release in 2016.